The Amazon Spheres are three spherical conservatories on the headquarters campus of Amazon in Seattle, Washington, United States. Designed by NBBJ and Landscape Architect Site Workshop, the three glass domes are covered in pentagonal hexecontahedron panels and serve as an employee lounge and workspace. The domes, which range from three to four stories tall, house 40,000 plants as well as meeting space and retail stores. They are located under the Day 1 building on Lenora Street. The complex opened to Amazon employees and limited public access on January 30, 2018. The spheres are reserved mainly for Amazon employees, but are open to the public through weekly headquarters tours and an exhibit on the ground floor. The spheres are located along Lenora Street between 6th and 7th Avenues, under Day 1 in Amazon's Seattle headquarters campus. The three intersecting spherical domes range from 80 to 95 feet (24 to 29 m) in height and take up half of a city block. They use over 2,600 panes of glass and 620 short tons (560 t) of steel, arranged with five-sided panels of a pentagonal hexecontahedron. The largest sphere, in the center, is four stories tall and has 3,225 square feet (299.6 m2) of space; it houses the cafeteria, stairway, elevators, and bathrooms. The stairwell shaft is covered by a four-story "living wall" with 25,000 plants, including carnivorous species from Asia. The spheres have meeting spaces, tables, and benches that can seat a total of 800 people. The complex, nicknamed "Bezos' balls", has become a recognizable landmark and tourist attraction for the Denny Triangle area since the beginning of its construction. The structure has been compared to the city's iconic Space Needle, built as a futuristic landmark for the Century 21 Exposition in 1962. It takes cues from biophilic design, incorporating nature into the built environment. The spheres have 40,000 plants from 50 countries and are divided into three areas, with the western and eastern domes segregated into the Old World and New World. The domes are kept at a temperature of 72 °F (22 °C) and 60 percent humidity during the daytime. Amazon employed a full-time horticulturalist to grow the building's 40,000 plants over a three-year period at a greenhouse in Redmond. Amazon donated space in the greenhouse to the University of Washington's botany program during renovation of their Life Sciences Building in 2016. Among the 40 to 50 trees in the spheres, the largest is a 55-foot (17 m) Ficus rubiginosa tree, nicknamed "Rubi", which was lifted into the spheres by a crane in June 2017. An Amorphophallus titanum corpse flower named "Morticia" bloomed for 48 hours in October 2018, attracting 5,000 visitors to the Spheres as Amazon opened the facility to public viewing for a limited time. 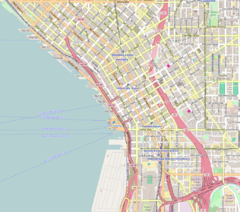 Amazon began planning a large Seattle headquarters campus in the early 2010s, acquiring three blocks in the Denny Triangle area in 2012. The original design for the second tower included a six-story building with flexible workspaces and a meeting center, but was later changed to a spherical conservatory. The revised design by NBBJ, which had been in development since 2012, was unveiled in May 2013 to a mixed reaction from the city's project design review board. While hailed as a bold design, it was criticized for the lack of rain protection, public access, and the amount of energy needed to climatize the facility. In August, NBBJ released an updated design that replaced the supporting steel structures under the glass with organic forms called "Catalan spheres". The city's design review board approved the design in October 2013, after slight changes to the understructure were made. Construction on the spheres began in 2015, and the first pieces of the steel structure were erected in February 2016. The steel was painted white and covered with glass panels that were installed beginning in April. The first plant, an Australian tree fern, was moved from the Redmond greenhouse and planted in May 2017. The spheres were dedicated on January 29, 2018, by Jeff Bezos, Mayor Jenny Durkan, County Executive Dow Constantine, and Governor Jay Inslee. Bezos ceremonially opened the complex using an Alexa voice command. It opened to Amazon employees the following day, along with a public exhibit named the "Understory" below the spheres. Public access to the spheres is provided as part of weekly guided tours of the Amazon headquarters campus and a twice-monthly weekend reservation program. ^ a b c d e Day, Matt (January 26, 2018). "Take a look inside Amazon's Spheres as they get set to open". The Seattle Times. p. A1. Archived from the original on January 28, 2018. Retrieved January 29, 2018. ^ a b c d Day, Matt (January 29, 2018). "'Happy' plants in the spotlight as CEO Jeff Bezos, luminaries open Amazon's Spheres". The Seattle Times. Archived from the original on January 30, 2018. Retrieved January 29, 2018. ^ a b c Day, Matt (January 26, 2018). "Go inside the Amazon Spheres. Here's how". The Seattle Times. Archived from the original on January 30, 2018. Retrieved January 29, 2018. ^ McGregor, Jena (January 29, 2018). "Why Amazon built its workers a mini rain forest inside three domes in downtown Seattle". The Washington Post. Archived from the original on January 30, 2018. Retrieved January 29, 2018. ^ Stinson, Elizabeth (May 6, 2017). "Amazon's Expansive Biodomes Get Their First of 40,000 Plants". Wired. Archived from the original on January 27, 2018. Retrieved January 29, 2018. ^ a b Schlosser, Kurt (January 26, 2018). "Welcome to Amazon's jungle: Inside the Spheres, where 40,000 plants create a stunning urban oasis". GeekWire. Retrieved February 18, 2018. ^ Cohen, Stephen (September 22, 2017). "How Seattle changed after Amazon came to town". Seattle Post-Intelligencer. Archived from the original on November 6, 2017. Retrieved February 1, 2018. ^ a b Sears, Kelton (March 18, 2016). "Using Nature as Inspiration, Architects and Designers Are Building Seattle's Biofuture". Seattle Weekly. ^ Soper, Spencer (January 26, 2018). "Inside Amazon's Giant Spheres, Where Workers Chill in a Mini Rainforest". Bloomberg News. Archived from the original on February 1, 2018. Retrieved February 1, 2018. ^ Long, Katherine (May 3, 2016). "Amazon facility will babysit UW greenhouse's 9,000 exotic plants". The Seattle Times. Archived from the original on February 2, 2018. Retrieved February 1, 2018. ^ Wingfield, Nick (July 10, 2016). "Forget Beanbag Chairs. Amazon Is Giving Its Workers Treehouses". The New York Times. p. B1. Retrieved February 18, 2018. ^ Stiles, Marc (June 21, 2017). "Hello, Rubi: Amazon drops big tree into its Seattle Spheres forest". Puget Sound Business Journal. Archived from the original on June 26, 2017. Retrieved February 1, 2018. ^ Lisota, Kevin (October 21, 2018). "Crowds pack Amazon Spheres for a whiff and glimpse of ultra-rare blooming of corpse flower". GeekWire. Retrieved October 27, 2018. ^ Pryne, Eric (February 16, 2012). "Amazon to buy Denny Triangle property; plans 3 big office towers". The Seattle Times. p. A1. Retrieved February 17, 2018. ^ González, Ángel (January 3, 2017). "Amazon's Spheres: Lush nature paradise to adorn $4 billion urban campus". The Seattle Times. p. A8. Retrieved February 17, 2018. ^ Silver, Jon (May 22, 2013). "Amazon's dome idea could create a new city landmark". Seattle Daily Journal of Commerce. Retrieved February 17, 2018. (Subscription required (help)). ^ Bhatt, Sanjay (May 22, 2013). "Amazon's plan for giant spheres gets mixed reaction". The Seattle Times. p. A1. Retrieved February 17, 2018. ^ Wohlsen, Marcus (May 23, 2013). "Amazon's Urban Biospheres Give New Meaning to 'Tech Bubble'". Wired. Retrieved February 17, 2018. ^ Capps, Kriston (August 21, 2013). "Amazon Submits Phase-Two Proposal for New Catalan-Sphere Headquarters in Seattle". Architect. Retrieved February 17, 2018. ^ Bhatt, Sanjay (August 19, 2013). "Amazon bubble building gets a cellular look". The Seattle Times. Retrieved February 17, 2018. ^ Bhatt, Sanjay (October 23, 2013). "Amazon's bubble building gets OK from design panel". The Seattle Times. p. A11. Retrieved February 17, 2018. ^ Demmitt, Jacob (September 30, 2015). "Aerial photos show Amazon's epic biospheres taking shape in Seattle". GeekWire. Retrieved February 17, 2018. ^ Bishop, Todd (February 3, 2016). "Amazon's giant Seattle biodomes start getting huge steel exoskeleton". GeekWire. Retrieved February 17, 2018. ^ Bishop, Todd (April 26, 2016). "Amazon's giant Seattle biospheres come into focus with installation of first glass panels". GeekWire. Retrieved February 17, 2018. ^ Schlosser, Kurt (January 16, 2018). "As Amazon's Spheres near opening day, website launches to showcase unique Seattle structures". GeekWire. Retrieved February 17, 2018. ^ Walters, Kate (May 4, 2017). "Rare jungle begins move into Amazon's giant orbs". KUOW. Retrieved February 17, 2018. ^ Day, Matt (April 4, 2018). "Amazon will open Spheres to public twice a month". The Seattle Times. Retrieved April 4, 2018. Wikimedia Commons has media related to Amazon Spheres.